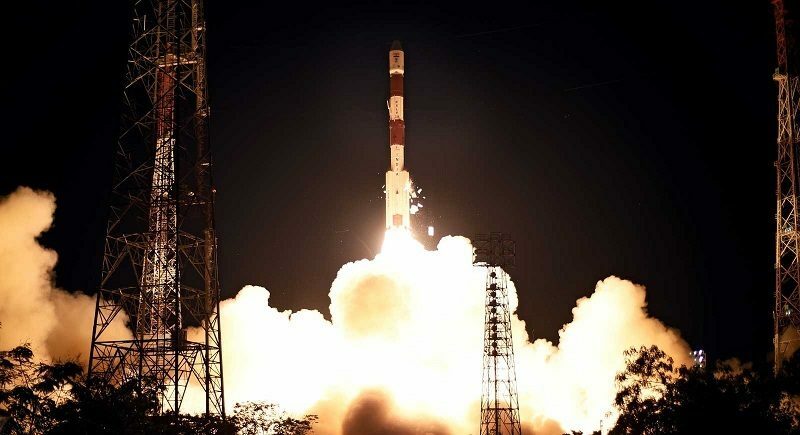 According to the Indian Space Research Organization, PSLV’s fate was sealed three and a half minutes into its planned 19.5-minute mission when the protective payload fairing failed to separate from the ascending rocket. Dragging the dead weight of the fairing, the rocket did not have the energy needed to attain its planned orbit peaking 20,650 Kilometers in altitude and only reached a much lower orbit of 167 by 6,555 Kilometers. Orbital data from the Joint Space Operations Center showed only one object related to this launch, confirming that the fairing held up and was containing the IRNSS-1H satellite after it separated from the rocket’s upper stage – creating a potentially dangerous configuration with a fully-fueled satellite bouncing around within the fairing. 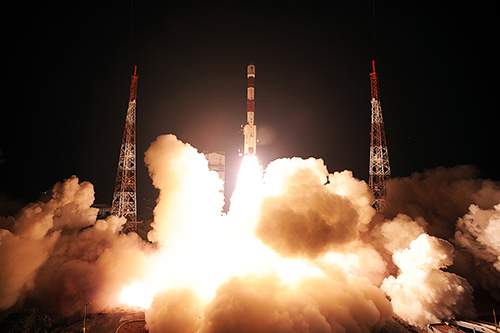 Thursday’s launch marked the 41st flight carried out by the Polar Satellite Launch Vehicle that has become the undisputed workhorse of the Indian space program – supporting the country’s Earth observation programs, sending up communications satellites and dispatching probes to the Moon and Mars, also becoming a player on the commercial launch market as a cost-effective alternative for small satellite operators. 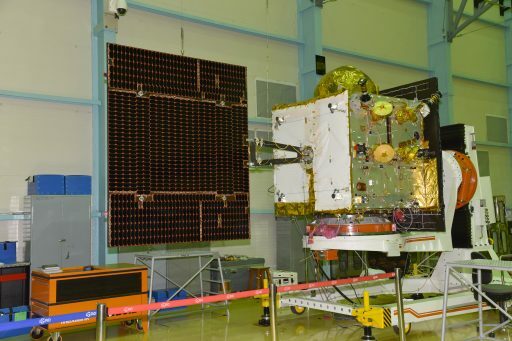 It marked the third failure encountered by PSLV following a mishap on its very first mission in 1993 and a partial failure on its first operational flight in 1997 that left the payload in a lower-than-planned orbit. 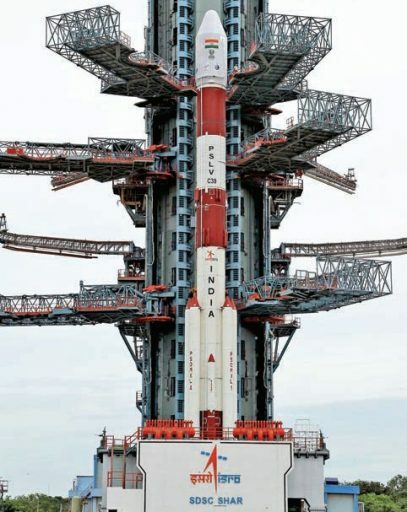 PSLV had raked up 36 consecutive successes since its C2 mission in 1999 and, in recent years, stepped up its launch pace to become a dependable workhorse, not only for India, but a number of international customers that placed satellites on the four-stage rocket. Thursday’s flight started with an on-time liftoff at 7 p.m. local time, 13:30 UTC from the Second Launch Pad at the Satish Dhawan Space Center on India’s East Coast. Blasting off half an hour after sunset, PSLV raced into the night under the loud thunder of its massive solid-fueled core stage and four ground-lit boosters, catapulting the vehicle off its pad with a thrust of 700 metric-ton-force. Powering away from the Indian coast toward the south east, PSLV ignited the two remaining boosters when passing 25 seconds into the mission to increase the vehicle’s thrust to over 800 metric ton-force. The 44.4-meter tall rocket shed the four ground-lits at T+70 seconds followed by the twin air-lit boosters one minute and 32 seconds into the mission while the first stage continued to burn until T+110 seconds. With the 20-meter long core stage dropping away, PSLV fired up the liquid-fueled Vikas 4 engine on the second stage, pushing the vehicle out of the atmosphere with a thrust of 81,500 Kilogram-force. 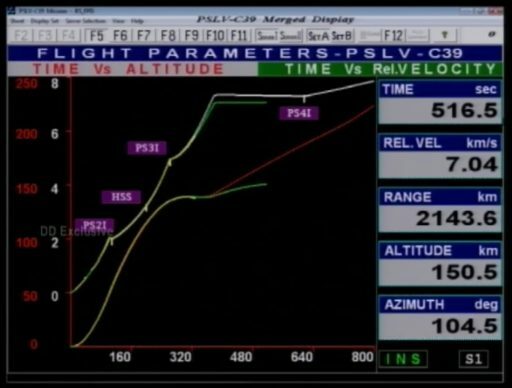 Three minutes and 24 seconds into the mission, PSLV had reached an altitude of 115 Kilometers, making it safe to jettison the payload fairing that enshrouds the delicate satellite during atmospheric flight to protect it from aerodynamic forces which would easily rip it apart. Fairing separation is completed as early as safely possible to shed no-longer-needed mass and thus increase the rocket’s performance, having to push less weight into orbit. However, in Thursday’s case, no verbal confirmation of fairing separation was provided in real time and telemetry displays showing flight event times based on sensor data from the rocket did not register the fairing separation. The second stage handed over to the solid-fueled third stage four minutes and 24 seconds into the flight, firing up its rocket motor on a 112-second burn to accelerate the vehicle onto a sub-orbital arc. Plots displaying the rocket’s velocity vs. time and altitude vs. time as it progressed toward orbit began showing a considerable underperformance as the third stage was burning – a result of the rocket carrying the additional 1,150 Kilograms of fairing mass that were not planned to be present at this stage of the flight. 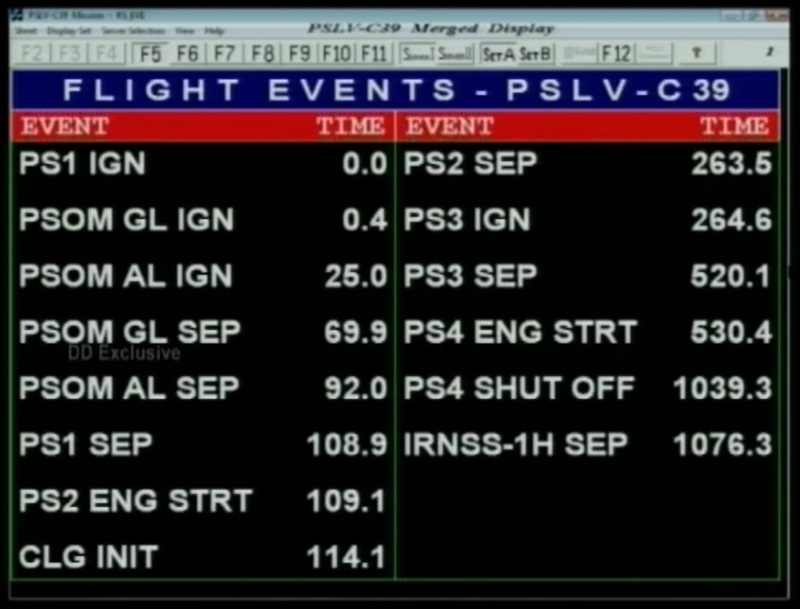 The third stage managed to accelerate the vehicle to a speed of 6.96 Kilometers per second whereas the planned PS3 cutoff speed was 7.28km/s, representing a shortfall of 320 meters per second. 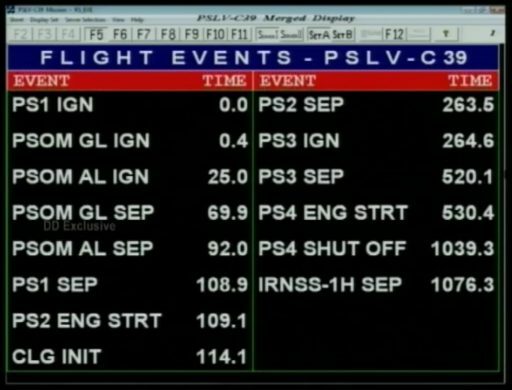 In an attempt to rectify the situation, PSLV’s computers calculated a new flight profile for the fourth stage, firing up its twin L-2-5 engines eight minutes and 50 seconds into the flight, around one and a half minutes earlier than planned. The fourth stage was up and running for eight minutes and 48 seconds, consuming all available propellants in an effort to stretch the rocket’s available energy. Data displays showed PSLV achieved an orbit of 167.4 by 6,554.8 Kilometers, inclined 19.18 degrees – well short of the target 284 x 20,650-Kilometer orbit. Spacecraft separation was commanded 17 minutes and 56 seconds into the flight at which point loaded springs were to push the IRNSS-1H satellite away from the rocket’s fourth stage. 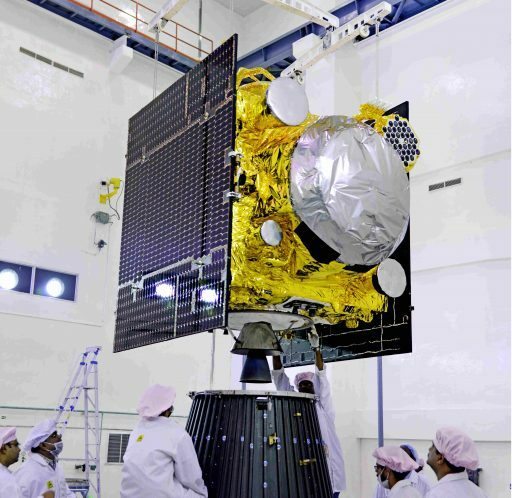 ISRO confirmed to reporters that the IRNSS-1H satellite separated from the fourth stage and was floating within the 3.2-meter diameter payload fairing. The satellite was likely programmed to extend its power-generating solar arrays after a defined period of time following separation which could be another potentially harmful event with the fairing still in position. Tracking data released later on Thursday showed only one object in orbit, confirming that the fairing held up and was containing the satellite. Given the low perigee altitude, the combined Stage 4 / IRNSS-1H / Fairing will re-enter fairly swiftly. Thursday’s PSLV mission carried IRNSS-1H – the eighth satellite to launch as part of the Indian Regional Navigation Satellite System (IRNSS) and one of two ground spares built for the operational seven-satellite constellation called into service after clock failures on the IRNSS-1A satellite left the orbiting constellation without redundancy. Initiated in 2006, the IRNSS project has the overall goal of establishing an independent navigation capability across India for government and civilian use, ending reliance on outside programs such as GPS which may be disabled in times of distress. 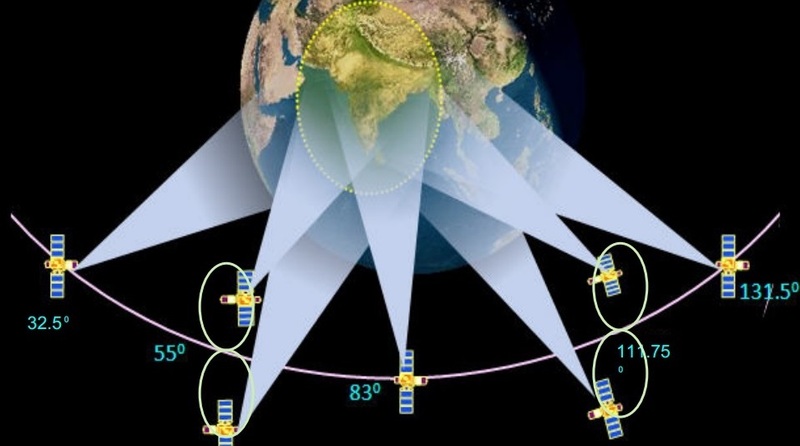 Opting for a regional solution, India deployed seven IRNSS satellites between 2013 and 2016, three residing in Geostationary Orbit above the equator and four orbit in inclined Geosynchronous Orbits using two orbital planes to create a coverage area across the entire Indian territory and around 1,500 Kilometers beyond its borders. The satellites are nearly identical, based on the Indian Space Research Organization’s I-1K platform, each weighing in at around 1,425 Kilograms and hosting three rubidium atomic clocks that deliver the ultra-precise timing needed for the generation of navigation signals which are then transmitted to the ground in the L5 band and processed by compatible receivers to calculate a user’s position via triangulation – requiring a sufficient number of satellites, typically four, to be visible at any given time. IRNSS was designed with redundancy on the constellation and satellite levels – installing three clocks on each satellite to protect against isolated failures and operating the constellation in a one-redundant configuration. Additional insurance against a system outage came in the form of two ground spares, intended to be sent up in case any of the active satellites encountered problems to guarantee the first IRNSS generation can meet its planned ten-year life time. The problems aboard IRNSS-1A began in mid-2016 with the failure of one of its three atomic clocks with the other two following suit over the course of the second half of the year. This left the satellite severely disabled in its ability to deliver accurate navigation data. IRNSS-1A is still providing systems messages and coarse navigation signals but is not useful in precision applications. The plot thickened in 2016 when the European Galileo constellation also noted an alarming failure rate on its clocks, affecting both types used on the European system – the more accurate Hydrogen Masers and the Rubidium Atomic Standard Clocks which are considered more robust. IRNSS, Galileo and China’s Beidou-2 navigation systems all use clocks from the same supplier, Swiss company Spectratime, and analysis of the failures on IRNSS and Galileo showed the exact same mechanism that implicated an inexpensive electronics component causing short circuits within the clocks. The early Galileo In-Orbit Validation Satellites and the Beidou-2 system were not affected by the clock troubles as an earlier production series at Spectratime did not feature the component in question. As a result of the inquiry into the clock troubles, existing clocks were removed from the two IRNSS spares and Galileo satellites waiting for launch to undergo repairs before being re-installed on their respective satellites. However, for the satellites already in orbit, there is no fix for the systemic clock issue – leaving 18 Galileo satellites and seven first generation IRNSS satellites at risk of complete rubidium clock failure. To extend the operational lives of the satellites in orbit, ISRO decided to change the procedure of how the three clocks are operated. Initially, two clocks were kept in a powered state with one in primary mode and the other as a hot backup while the third was powered down. As a life extension measure, IRNSS satellites now only have one clock in a powered state, keeping the other powered off to preserve their useful lifetime for when they are needed. To keep the constellation in a fully operational configuration, ISRO elected to call up the two ground spares for launch in 2017. IRNSS-1H was to maneuver into a 29-degree inclined Geosynchronous Orbit at 55 degrees East to replace the IRNSS-1A satellite launched in July 2013. 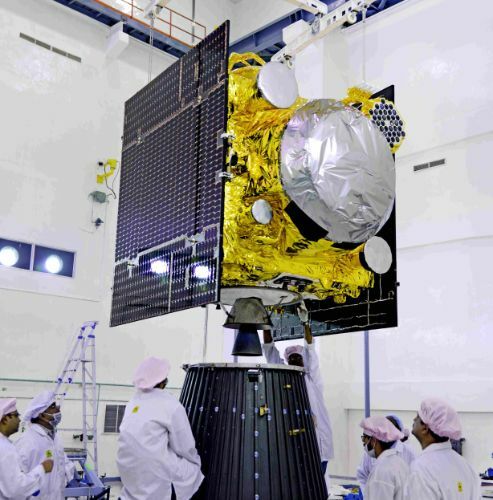 This role will now be filled by the IRNSS-1I satellite that had been preparing for a November liftoff on a PSLV to join the constellation as additional backup in case of future clock troubles.